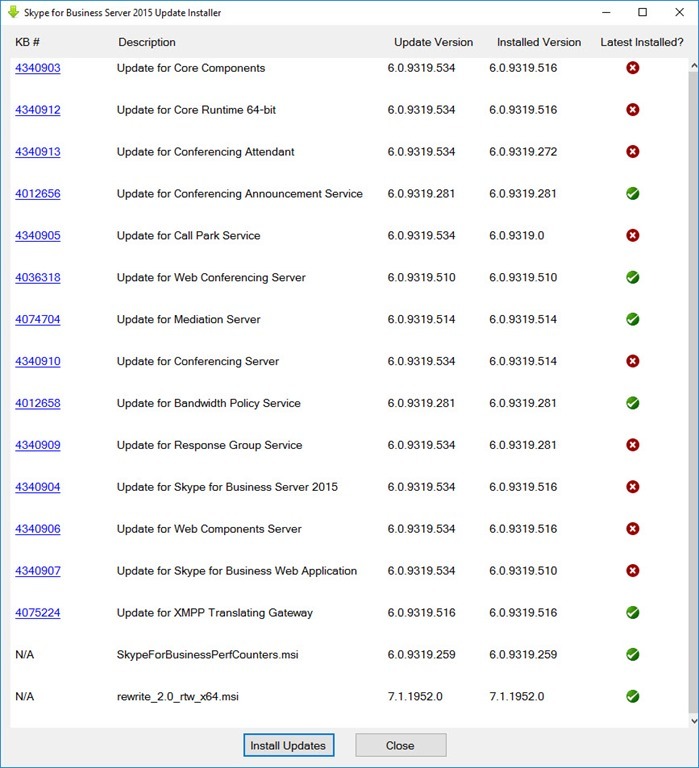 Our August 2018 update – officially CU7 – nudges the server up from 6.0.9319.516 to 6.0.9319.534 and updates 9 components on my Standard Edition Front-End. Kb4100776 Microsoft SQL Server 2016 SP1 is available for the Back End servers of Skype for Business Server 2015. A long-sought-after option has been the ability to permit anonymous PSTN participants to automatically join (and start) a conference call. This has existed since the March 2016 update (6.0.9319.235) but only for dynamic meetings. In this update Microsoft has added the new “AllowAnonymousPstnActivationForDedicatedMeetings”, and which if set true will let anonymous participants do their thing without supervision in a user’s static/default meeting space. I hope this won’t be a big deal for anyone, but with CU7 MS has toggled the default setting for its hosted meeting join plugin. Added in CU5 back in May 2017, it defaulted to Off. After you install CU7 this will flip to on ($true), so if you’re determined NOT to use the CDN, you’ll need to flip it back again. 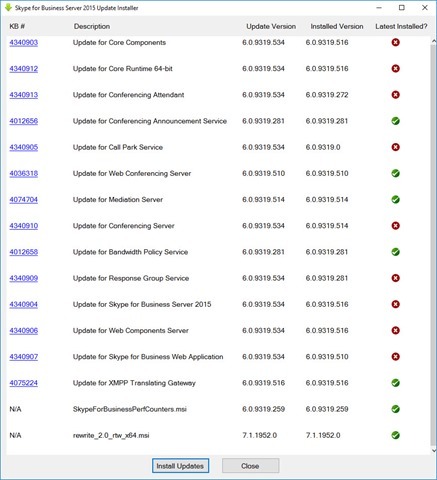 This issue will be fixed in the next cumulate update of Skype for Business Server 2015. I had quite a few problems getting these all updated in my Lab, and I’m recommending extra caution here. On my Lab’s woefully under-resourced Standard Edition servers (with only 4 cores and 4G RAM) the updates took easily 8 hours, and sometimes individual updates failed. While this was taking place the server was in an essentially unresponsive state, displaying the “Limited Functionality Mode” message. If your Production VMs are under-resourced and the hosts over-committed, I STRONGLY recommend you boost them, and in the meantime don’t run the database updates – or execute Bootstrapper (with its inbuilt database update step) – during business hours. 1st August 2018: This is the initial release.